Perhaps more than the Historic Garrison District or the Loyalist Burial Ground, Fredericton’s roots as a British military townsite are reflected in the orderly grid pattern of streets that criss-cross the city’s core. Regent St, Smythe St (“Smyth St” and “Brick Kiln Rd” at the time), Waterloo Row and Woodstock Rd, and so on – all go back to a cookie-cutter town plan set out by military engineers here and elsewhere throughout the British Empire. For centuries, Frederictonians grew up, played, commuted and shopped along grid streets like these. They would’ve been pretty easy to remember what was where, and to give directions. Getting around traffic jams (horse and buggy accidents?) would be relatively straightforward – just turn away and go down the next block. You could quickly find out and take short cuts – just zig-zag at the intersections. Planning expansions would be pretty predictable – just make the street longer. It also lent well to making interesting streetscapes. Ceremonial sites or buildings like schools or City Hall could get landmark locations at corners or at the end of a roadway. The Burial Ground mid-block interrupting Carleton St (“Charleton St”) provided a dignified vista looking up and down the street. Regular placement of parks every few blocks ensured everyone had good, predictable access to commons in which to meet and play. Newer developments, however, follow a more unpredictable plan. Fredericton’s neighbourhoods outside the original Town Plat favour patterns with crescents, bays and cul-de-sacs – or in road design-speak, warped parallels, loops and lollipops, or lollipops on a stick. Because these newer areas are planned and built by developers on privately-owned land, they want to make sure that more area is used for money-making homes, and less on unprofitable spaces like streets: while the Town Plat’s rectangular grid needs about 31% of the area for roads, loopy subdivisions use only about 27%. These suburban plans focus on making car traffic faster: with grids come intersections, each of which forces cars to slow down and, at high volumes, congest into gridlock. Suburban plans design streets to feed into collector or arterial roads, wider and with few intersections so cars can drive faster. They also focus on privacy and making it harder to get to individual streets: while grids make it possible for cars (and pedestrians) to take short-cuts and pass any which way, suburban plans force drive-through traffic to one or two main roads, and limit traffic along smaller ones to only those cars actually going to/from points on that road. In many of Fredericton’s new developments, however, using a non-grid suburban pattern can make getting around difficult. Connexions between subdivisions are often winding and complicated. For example, Crocket St in the city’s Northside, is a residential street with homes lining both sides of the road. But because it’s the only road connecting Cliffe St and Canada St as a route from Marysville towards the city centre, it carries a disproportionate amount of traffic, well over and above that of the residents who actually live there: according to the Capital City Traffic Study Update, 7 300 vehicles a day. (By comparison, Woodstock Rd, a major thoroughfare as provincial Route 102, carries 7 050; Clements Dr, as Route 105, carries 7 350.) Future developments off of Crocket St, in the usual suburban pattern, will increase the load. What’s more, suburban plans, with their dead-end streets and limited options for routes, force pedestrians onto those busy arterial roads to get around – potential safety hazards for children walking to school, and discouraging strolls to a park, convenience store or work. By limiting the options for short-cutting, they also increase the distance pedestrians need to walk to get from any given point A to point B. It also makes it harder to adapt zoning to mix in amenities: commercial areas or parks tend to be segregated away from residential streets to those arterial roads. The winding roads also make it hard to provide fast bus routes, and slow down emergency vehicles rushing to respond within the neighbourhood. A problem with conventional subdivision loop and curl street patterns is that they inhibit walking and are disorienting and confusing to pedestrians as well as to drivers. They provide tranquility, safety and security at the expense of connectivity. They control traffic well but often create bottlenecks at peak times in predictable spots. 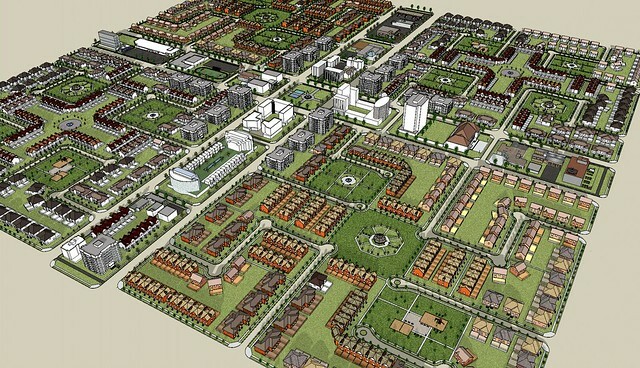 By the 1990s the problems of suburban sprawl were becoming evident and a new movement called “Smart Growth” evolved to promote the design of communities that are more compact, with a mix of land uses, well-connected streets and sidewalks, and public transit that would encourage a change in travel behaviour so that the residents would walk and bicycle more and drive less. One way to get the benefits of grid patterns – an open network of paths, able to mix amenities with residential areas, and shortened and simplified commuting – and suburban patterns – limited traffic on residential streets – is a pattern of quadrants, or a Fused Grid. There are blocks of crescents and cul-de-sacs like in the suburbs, but each has multiple access routes to an open grid of bigger streets that keep traffic moving, keeps amenity areas within a five-minute walking distance, and opens the potential for efficient, criss-crossing bus routes to the area. Perhaps some of the problems with getting around Fredericton’s suburban neighbourhoods could be improved with elements of a fused grid network. If future roads and subdivisions were planned along these lines, our communities could be safer, easier to get around – by car, bus, on foot and by bike, whatever your fancy – and more adaptable to changing amenity needs like parks, schools and commercial areas. What do you think? How are the streets in your area? Do you always find yourself taking a long-way around, or do you have lots of short cuts to take? Is there only one road in and out of your area – and do you get traffic jams? What would make getting around your neighbourhood and to the rest of town easier? I believe that the grid pattern in urban planning is actually Greek and exported to Britain by the Romans. Thanks, I stand corrected. Whether Greek or British or Roman, many Frederictonians visit Europe and admire qualities of cities on the other side of the Atlantic – interesting streets, distinctive districts, places to live and work and play close together. Do you think “being more European” in the way our city is laid out would make Fredericton better? Or on the other hand, what do we have in Fredericton that makes our city better than elsewhere? Thanks – yes, one could “retrofit” a current grid neighbourhood with elements of fused grid. Vancouver’s West End (http://maps.google.ca/maps?q=west+end+vancouver&ll=49.289824,-123.135087&spn=0.008243,0.01929&client=safari&oe=UTF-8&hnear=West+End,+Vancouver,+Greater+Vancouver+Regional+District,+British+Columbia&gl=ca&t=m&z=16) has several streets blocked off to cars, where the streets are turned into parks with pedestrian paths that maintain access while redirecting cars away. Is traffic feeding into residential areas around Downtown Fredericton a big problem – what streets would you think of blocking off? How effective are the traffic calming measures already in place: speed bumps, intersection islands, etc? Do you think blocking traffic from entering residential areas could lead to more bottlenecks along the major streets? WRT Taeyon’s remarks, I could certainly see King St and Queen St closed off to all traffic (except early morning deliveries etc between Regent and York. I lived in Glasgow for a year and in Ottawa, too, and each has decent stretches of ‘main’ streets in their commercial districts as sole pedestrian thoroughfares. I can’t see the need for it in most of Fredericton’s residential areas though. There is generally so little traffic in most residential neighbourhoods here. A lot of what non-Europeans like about old Europe (and even new Europe) is their architecture and built/buried heritage. Admittedly, the quirky and sometimes cobbled streets add to that, but it can also be a pain too (much narrower roads, impractical in northern climates). I actually had an email from someone in Dublin today, telling me how much he really liked Fredericton’s heritage homes and the river. These two items seem to frequently be at risk by inadequate municipal by-laws. We’ll never be able to re-create a medieval town in Fredericton, but we can take many more steps to ensure that the unique built/buried and natural heritage of Fredericton isn’t lost. The main reason that we are able to enjoy old European architecture is because they have strong preservation laws and see the obvious benefits of keeping old building stock. If they had the same laws as Fredericton, we’d be seeing far less older building in our favourite European cities. All interesting points, thanks for the insights on the European experience. I suspect that there is also more public awareness generally about the benefits of maintaining existing buildings in other communities, versus here. Although heritage buildings are celebrated in Fredericton’s tourism literature, there are so many buildings Downtown that remain vacant or undeveloped. Another aspect could be the local culture surrounding built environments and architecture generally – there also seems to be a lack of demand or interest in high-quality design in Fredericton. New commercial construction follows standard plans from national chains across the country. As for housing, neighbourhoods are indistinguishable from suburbs developed until the 1990s in other Canadian cities – Fredericton doesn’t have any developments to match current practice in the rest of Canada, like higher-end condos/apartments Downtown, or subdivisions to match New Urbanism-type communities. What do you think? Any ideas on how to raise expectations in Fredericton for better development? That’s an excellent point and part of a conversation I recently had with a few friends, about the lack of interesting architecture in modern Fredericton/NB. While back for Xmas in the Toronto area, I was impressed, again, by the quality of small and especially large scale architecture. Several new buildings going up are really very interesting, as are most of the large building built in the Toronto area in the last couple decades. See the Picasso condos (http://urbantoronto.ca/database/projects/picasso-condos) for instance or the re-purposing of older buildings in downtown TO http://urbantoronto.ca/news/2011/12/steel-rising-333-king-street-east. And certainly in Europe, rarely do you such unimaginitive architecture as you do in this province. I can only guess that opening the publics eyes to what is possible and the way that most of the rest of western civilization is progressing will cause that demand. Fingers crossed. I am delighted to see the fused grid being discussed as a layout option for subdvisions, districts and cities. Thank you for your positive view of it. Having worked on it before leaving CMHC, it is rewarding to see that this model is appreciated and gaining traction. Several things have happened in the intervening years that might help the Better Fredericton campaign/discussion to ground its proposals and promotion. To view articles on the fused grid, an extensive library of drawings, presentations and photographs, showing Canadian and European examples you could visit these sites. All these are to use for anyone who has an interest in the model. Other articles on the merits and methods of the fused grid you could find on the web site Planetizen (www. planetizen.com ) under my name.